Олександра Шевченко: У мене почався ПМС! This entry was posted in UA and tagged блог on September 1, 2011 by FEMEN. This entry was posted in UA and tagged блог on August 31, 2011 by FEMEN. Олександра Шевченко: FEMEN бере Тимошенко на поруки. This entry was posted in UA and tagged блог on August 18, 2011 by FEMEN. This entry was posted in UA and tagged блог on July 18, 2011 by FEMEN. 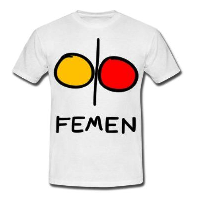 This entry was posted in EN, UA and tagged video on July 9, 2011 by FEMEN. This entry was posted in UA and tagged блог on June 1, 2011 by FEMEN.